With over 2,400 video courses from which to choose, the online classes offered at Lynda cover all levels of experience, from technical skills and creative techniques to business strategies. New courses are added weekly and Lynda allows you to learn on the go or at home with your computer, tablet, or mobile device. Lynda is a top online education platform which has logged 4 million subscribers from 150 different countries. Some of the members of Lynda include companies such as Apple, Adobe and even the Office of the President of the United States. The professors at Lynda are extremely knowledgeable in their field and work with you to learn everything there is to learn. For example, Aaron Dolberg teaches two courses on software engineering, and his past experience makes him a valuable asset. He was part of the engineering teams that developed Flash Professional, Flash Player, Flex and Flash Catalyst. With a vast library of video tutorials led by experts, there's a lot to explore with Lynda. Follow along in the development of Bert Monroy's latest artwork, _Amsterdam Mist_! 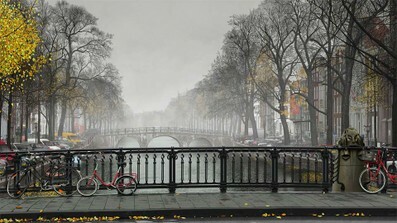 This course, the second volume in the [series](http://www.lynda.com/search?q=amsterdam+mist), focuses on the natural elements in this incredible painting, created over twenty-two painstaking months with Photoshop CC. Learn how Bert rendered the trees lining the canal—the branches, bark, and remaining leaves—as well as the reflections and ripples on the surface of the canal waters. Then see how he added a sense of depth and realism to the fog in the scene, with layers. Watch and learn how to apply these techniques to your own artwork.